Over the past few years, music education has changed significantly. Whilst many musicians continue to enjoy learning with a teacher, or from a book, there are a growing number of young people who now turn to online video platforms such as YouTube, or more specialist sites when they want to learn something new. As a teacher in a music school, and as a writer of tuition books, this shift in approach has been hard to ignore. Eighteen months ago, I decided that it was time to enter the world of online video tuition myself. In truth, I’d been considering this for many years, but had procrastinated due to my already busy schedule of teaching, gigging and writing. Now, the time seemed right: a sizable market for online tuition had sprung up, and I was keen to put my extensive experience as a classroom teacher to use for myself. Rather than simply throw myself into the somewhat daunting task of writing, filming and editing a range of courses, I initially decided to test the waters with a simple YouTube series. Over the last few years I had written and recorded a huge selection of riffs and exercises that needed a home, and I decided to use these as the raw material for my new series: Bass Lick of the Week. Creating the first few weeks’ worth of lessons was both challenging and time-consuming: I had to acquire a whole new skill-set, which included setting up lighting, recording my voice, editing video, and not least of all, being comfortable in front of the camera (this last point should not be underestimated!). As I gained experience in each of these areas, the process became quicker, easier and – thankfully – more enjoyable. Fortunately, Bass Lick of the Week proved to be a big success: the lessons were well-received by bass players all over the world, and I was genuinely surprised by the huge number of positive comments and emails that I received. As I write this, the series is drawing to a close, 52 weeks and 52 lessons later. These courses are based on the books of the same name and feature play-along tracks written in the style of many well-known bass players. Each course contains a full play-through of the piece, followed by detailed section-by-section lessons on how to play it. There’s also a breakdown of the artist’s tone, and how to replicate it. Downloadable transcriptions and backing tracks are available for each course. This course is based on the first section of my popular Ultimate Slap Bass book and covers basic slapping and popping techniques, the use of ghost notes and muting, hammer-ons, pull-offs, trills and much more. There are downloadable PDF worksheets and backing tracks for each section of this course. This course covers a logical process for learning scales and arpeggios using my ‘content over patterns’ theory, which avoids the use of patterns and box shapes, and instead focuses on the notes. In these courses, I take a popular song for bass players to learn and break it down, section by section. So far, I’ve covered tracks such as ‘Tommy the Cat’ (Primus), ‘Hit Me with Your Rhythm Stick’ (Ian Dury & the Blockheads), ‘Forget Me Nots’ (Patrice Rushen), ‘The Machine Stops’ (Level 42) and ‘Hump de Bump’ (Red Hot Chili Peppers). All of these video courses are available to customers via subscription, which can either be paid monthly or annually. In an effort to make this available to as many people as possible, pricing is very affordable: just £7.99 per month, or £89 for the whole year. And if you’d like to sample the courses before signing up, you’ll find that the first lesson of each course is free. As you might expect, the selection of courses described above is just the beginning. 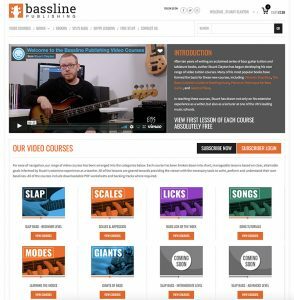 Over the coming weeks and months, I’ll be adding the Intermediate and Advanced slap bass courses, a range that covers plectrum and tapping techniques, more courses on scales, modes and arpeggios, and further song tutorials. Over time, I’ll also be adding more material into the existing courses. In short, there will be always be new content to get your teeth into! I hope you enjoy checking out my new range of video courses – please feel free to drop me an email with any comments or suggestions. Congratulations on your new range of video courses. I'm sure it is going to be a big success. Some questions, however, need to be clarified regarding the subscription model since I could not find any "terms and condition". If one chooses the monthly option does it renew automatically? Can one cancel/renew at any time. Thanks, Greg. Hi Greg, thank you, I certainly hope it is a success! In answer to your question, if you subscribe, it renews automatically the following month. Of course, you can cancel it at any time. I'll get this added into the Terms and Conditions on the site. Thanks for the prompt response Stuart. Is there a link to the Terms and Conditions? Thanks!